The Press Council of India and its counterpart in Myanmar signed a Memorandum of Understanding (MoU) on cooperation in the field of media during Prime Minister Narendra Modi’s visit to Nay Pyi Taw on Wednesday. The first such MoU between the two neighbours assumes significance for the northeastern region of the country. Myanmar is one of India’s strategic neighbours and shares a 1,640-km-long border with a number of northeastern states, including militancy-hit Nagaland and Manipur. The MoU was signed by Justice Chandramauli Kumar Prasad, Chairman, Press Council of India, and U Aung Hla Tun, First Vice-Chairman, Myanmar Press Council, at the Presidential Palace in Nay Pyi Taw. 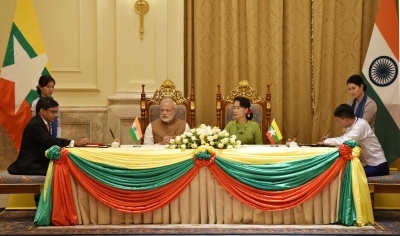 Besides Modi, present at the event were Myanmar President U Htin Kyaw and State Counsellor Daw Aung San Suu Kyi. Under the MoU, media in the two countries will exchange information, experience and knowledge. It urges restraint in coverage of matters likely to escalate conflict and wants the media to act as a catalyst in de-escalating conflict and providing a peaceful world order. In his joint statement later, Modi hoped that the MoU will go a long way in encouraging greater interaction between the two press councils.